I'm taking another stab at the camp colors of the week and making a window card. 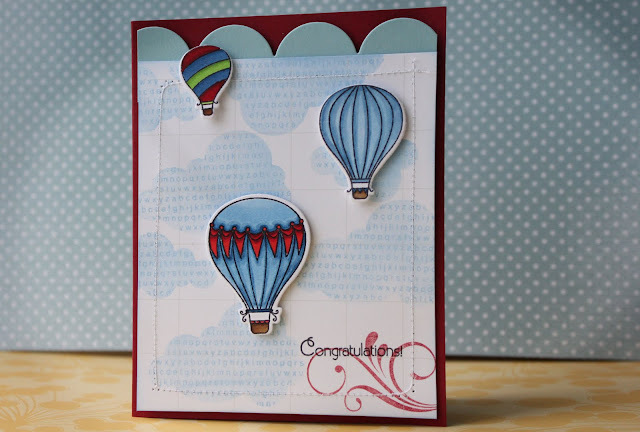 Jennifer shared some tips & tricks for creating a window card with our steel dies. So fun! I used my mat stack 5 die to cut into my card front, and created a frame for it using SU's peach parfait card-stock. The clouds and kites are from PTI's up up & away set, and the sentiment from think big favorites. I'm loving this card! The summery colors and the acetate window are so fun! Here's a close-up so you can see the "floating" greeting. I used part of the clear box that PTI stamps come in and stamped on it with staz-on ink (the acetate is slippery so staz-on is necessary!). From the time I was 8 years old to about 16 or 17, I went to the same summer camp every year - and it was easily the best part of the summer! 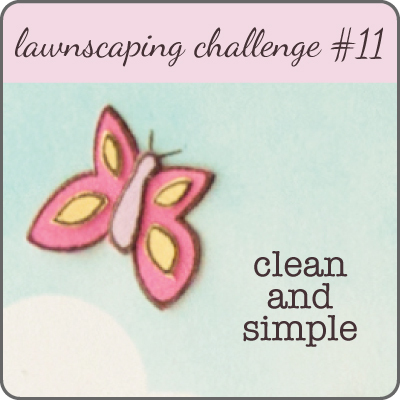 This summer I've joined an online summer card camp - and so far I'm loving it too! This week's color combo is so bright and lush - full of summer fun! I took Kristina's day 1 hint of going through my crafting supplies and scouting around for what would work with the color challenge. I pulled out some pretty papers from my humongous scrap pile (it really is huge) and pulled inspiration from them - especially the blue strip. I immediately thought of the "large than life" florals as a good match. Can you see I added some shine to the die-cut pieces? After I stamped them in versamark ink, I dabbed on some shimmer. To break up all the bright color, I tore into the hot-pink paper at the top, and added a strip of white cardstock (stamped with "text-style II" in memento black ink) to the bottom. A few snips later, and voila! a fun little fringe. I absolutely LOVED this card that Nichole Heady created during the June countdown posts - and now so thrilled that she created a how-to video! For my take, I created my mask in the same way that she taught, so that I could sponge fresh snow ink around, leaving a striking black rectangle in the middle of my mat. Perfect space for stamping my tulips (also in fresh snow ink) and then using a q-tip to apply some blue and green pastel inks. Do blue tulips even exist? The black panel was matted onto another layer, covered in BB: gingham. I finally think I've got the hang of lining up those ginghams! I love a full panel of that pattern - I'm going to be using it a lot more now! 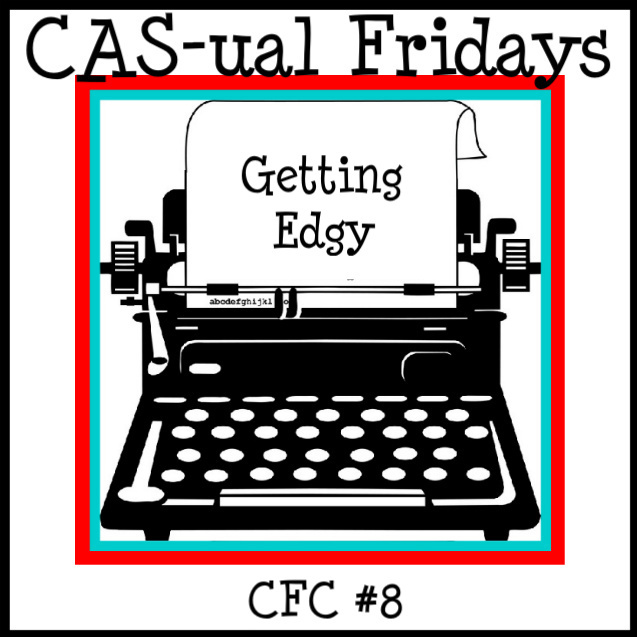 CAS-ual Friday... gettin' edgy wit it! It's that time again - CAS-ual Fridays challenge time! My oldest kidlet just finished her kindergarten year - and their class celebrated in style! THIRTEEN french songs performed (we live in a french-speaking province, for all you non-Canadians reading this blog!) and I couldn't believe that she mouthed every single word. In September she knew under 20 french words and now... she is basically schooling my husband - ha ha! Her teacher deserved a pretty card for all her hard work. Enter this week's "getting edgy" challenge. I cut some yummy melon berry felt with my largest scalloped border die, x2. Then I took some twill ribbon and pleated it as it went through the sewing machine. I stamped "merci" (from PTI's think big favorites #3) and then stamped the floral fusion image so it would nestle into the curve of the sentiment. To hide the stitches, the panel is adhered onto a white card base. I like the white-on-white... very chic! Another entry for MIM- reverse masking. 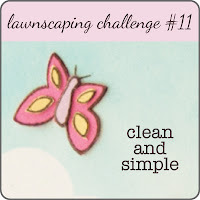 I've never entered any challenge twice - usually, after I finish making 1 entry, I am DONE with that technique. On to other things, you know? But I really love this one! I thought I'd play some more. I used "baby button bits" and stamped the floral image repeatedly to fill the white mat. I created the mask and went to town filling the flower centers with fun colors and stamped images. When I was all done, I thought the colors were too bright for my liking on the white mat, so I toned it down with some distress-inks. PTI blog hop - June edition! So, this month's inspiration was a bit different... no "themed challenge"... but instead, this awesome photo. You know I'm all about the eye-candy - I've been wasting so much time on pinterest, party blogs, etc... all for the eye candy :) And usually it's pretty easy for me to pick apart a color-scheme, or element of a picture and translate it to my paper-crafting... but this one? Yikes. I sat on it for many moons and had no idea what I could do with it. I tried out different ideas - swiping ink spots across the page to make those soft stripes... embossing a dragonfly stamp to mimic the shiny hook... princess-y images... but, somewhere in the space between the picture in my mind and the reality on the page... Uh-uh. BAM! how d'you like me now?? 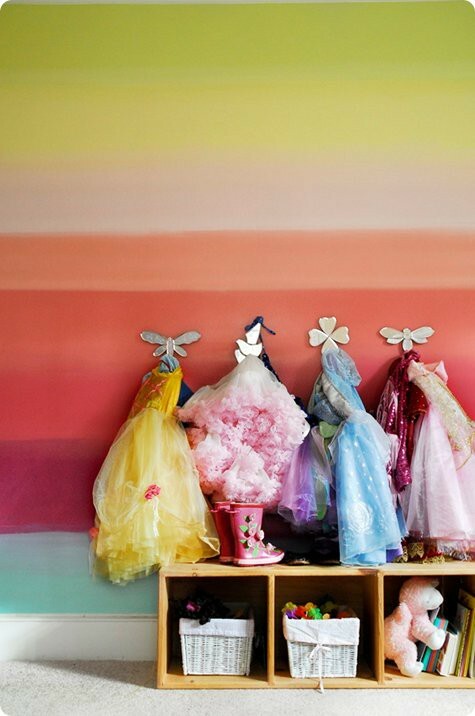 - the stripes on the wall. I mimicked the stripes by grabbing some SU "presto patterns" paper and sponging different ink colors on the various strips of paper. It looks like emboss-resist when you do that - so cool! - the bling of the hooks. I added the gem above the greeting (from think big favorites, I only inked up the "celebrate" in "celebrate today"). And there you have it! I hope you liked my take on the photo - I'm itching with excitement to check out other interpretations! I was asked to make a few graduation cards... this one's for a high-school girl. I'm thinking this teenage girl (who's apparently more "grown-up" than I am... word-for-word, that's what I was told by my friend... ha!) 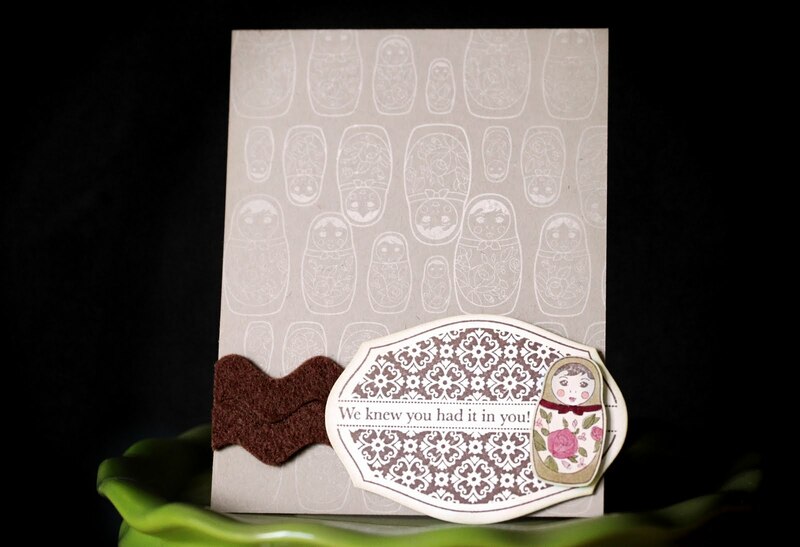 will appreciate the quirkiness of these little russian dolls :) Wouldn't this card also be perfect for a congratulations to a newly-pregnant friend? hee hee. It's a simple card, but I love it! I love this week's technique! Masking, and reverse masking are the most fun and versatile techniques, in my humble crafty opinion. Here, I used reverse masking to create those soft, billowy clouds. I die-cut the clouds onto a post-it note, and used the negative space to sponge in bashful blue ink, as well as SU's "A to Z" stamp. Super simple. I used PTI's "take 3" die to cut both the white frame as well as the color blocks. I then stamped each different colored block in versamark with different images from "background basics: hearts". The flower was made up of torn pages from an old book (I can hear Bethany gasping right now, at the thought of a book being torn apart... don't worry - not a literary classic or anything...) The pages were die-cut with beautiful blooms II and then frumped-up. I'm pretty sure "frumped-up" is an appropriate crafty term... An SU corduroy brad adds some texture, as do the felt leaves. The picture quality isn't the best since I just ran their pictures through my home-printer on vanilla cardstock. The punches I used are both SU! (for the pictures and the tiny tags). A little strip of designer paper ties the treats bags to the father's day decor. A simple, easy, and fast gift for father's day! folding it again this way. You'll want to find your center, basically. on the right, the red words aren't showing up well. they say "line it up with the scoreline"
Once you unfold your star, you'll need to re-adjust some of the score line to make it pop in the right places... when you're done, you'll have the perfect non-feminine embellishment for Father's Day! On the docket tomorrow: Father's Day treats! countdown to dad, part 3. These medallions are really fun and easy to make. I've never done a tutorial before, so forgive me if it's not very clear, but here are the steps I took to create them. score a strip of paper every 0.5 inch - easy-peasy on my scor-board! 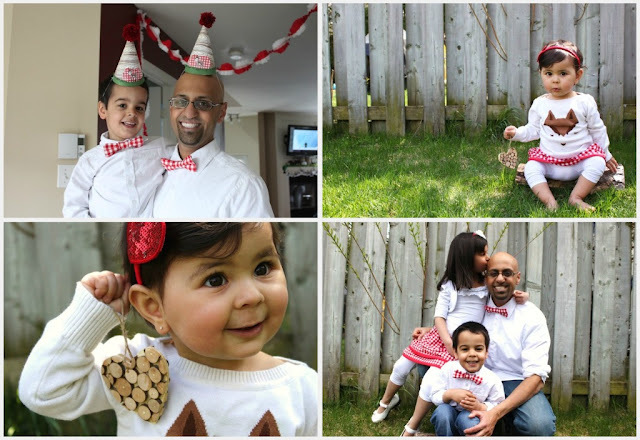 embellish it for father's day! I hope you found my little tutorial helpful! I love the look of a whole bunch of these medallions, in all different sizes, acting as the focal point at a party or wedding, even! Stay tuned tomorrow - I'll show you how to make a 5-point star. See him in the truck? hee hee. I was cracking myself up whilst sticking his tiny head in there... I'm such a nerd like that - you know people who breathlessly laugh at their own jokes, and everyone else just laughs at them because they're cracking themselves up? Yeah, that's me. Pathetic, I know. The vanilla focal point mat was covered with "text-style II" and then I grabbed every vehicle stamp I own (see PTI's tiny treats: birthday truck near the bottom? it's so cute!) and randomly stamped them around. I stamped the main truck (from SU's "loads of love") onto patterned paper and snipped it out, including making room for popping in the big daddy's head. A silver brad handle added just the right amount of man-bling. And then, I shifted gears. Father's Day. It's just another excuse to shower our good men with love, banners, decorations and sweet goodies. I'm in. I don't know what it is about switching to "party mode" but I started making things like nobody's business. Sooooo, I'm dubbing this week "MAN WEEK". To kick things, off - here's the card I made for my own papa. My dad is Greek, so we don't call him Dad, Father, Pops, Papa or anything like that. He's been Babaki or Ba to me for 30-some-odd years now and that's not about to change :) Ba means "dad" in Greek (obviously, you got that one), and Babaki is an affectionate way of saying it... "little daddy." I know I wrote d-a-d on the outside of this card (something funny looking about a big B-A) but there'll be a more familiar greeting inside. The stoplight was made with various punches - nothing complicated - and highlighted with a white gel pen. The handwriting is awful, right? But I really wanted to make this card personal - so I chicken scrawled "you've taught me so much on the road of life..."
I was trying to put labels on my posts (I just now, this morning, figured out how to do that - you'd think with a computer guy for a husband, I'd be able to better navigate all this blog stuff, but no. 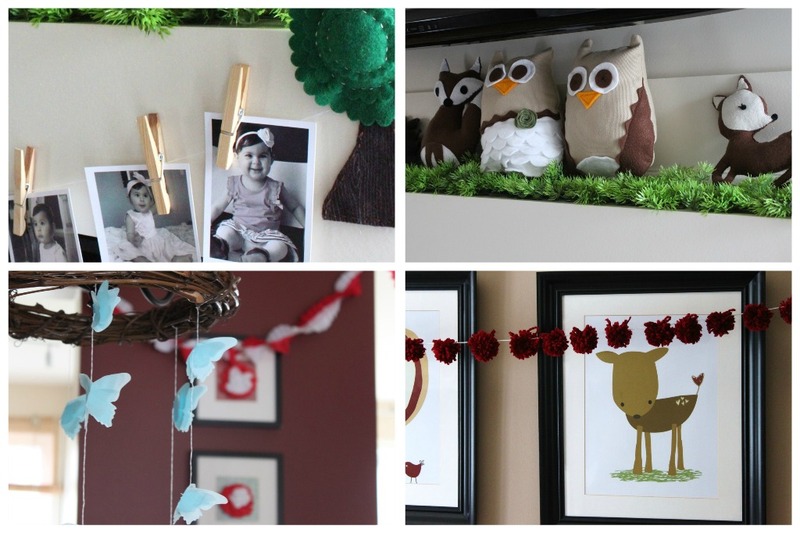 And btw, honey, if you're reading, sorry I called you a "computer guy" - I know what you do for a living, I really do) when I realized that I gave you 3 lead-up posts to my baby's 1st birthday party with no final show & tell. For shame, right? If you missed the previous posts, I made some woodland party hats here and made a stuffed hedgehog here. I also set the tone with an invitation here. The par-tay was in early May... so, some 6 weeks later - here are some snippets of what was created for Maia's big day! 1. felt trees (stamped with PTI's woodgrain set!) holding up month-by-month shots of Maia's first year on a "clothesline"
I wish I had gotten more photos - there are a few banners that never even saw the lens of my camera... and those smores on a stick... oh well - I have a pinterest photo somewhere to remind me! This super 3-D card is NOT going in any envelope - let's put it that way. I'm not sure where I was going with that pom-pom, but I'm not feeling well today and it looked cozy, so there. I'm entering this one into PTI's MIM challenge: "adding texture with tissue paper". On my white mat, I stamped an image from "turning a new leaf" in different directions in old olive ink. I then painted a thin layer of white glue onto it, and carefully-but-not-too-carefully placed a layer of white tissue paper on top (you know, the kind you use as filler in gift-bags...) It made a really cool texture! 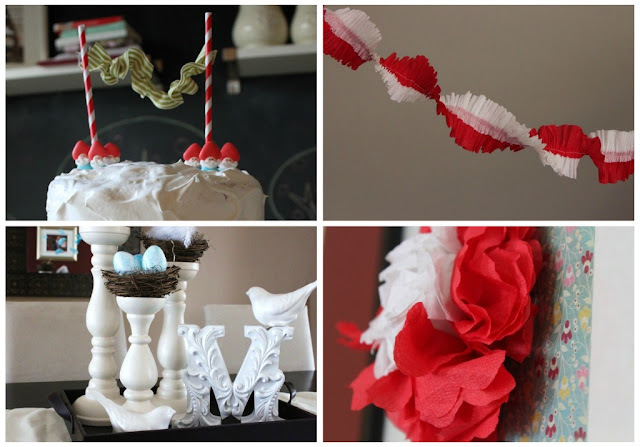 The pom-pom is so easy to make! There are so many tutorials out there, but this is a quick run-down of what I did. I wrapped and wrapped yarn around my index and middle fingers (bunch more fingers together, get a bigger pom) - until the whole thing was nice and thick. Then, I tied it in the middle (so now it looks like a figure 8, with a nice belt in the middle). I cut all of the loops with scissors - and the more you trim the pom, the better it looks. Actually, I can still see spots where it needs more of a haircut... but pretty cute! The brown layer is a chocolate chip mat stack 5, with a kraft scallop circle on top. Does the pom look a little like the center of a flower to you? A very funky flower? Good. We're on the same page. Have a super weekend, peeps! My 2 oldest kids (ages 4 and 6) are at that perfect age that if you do something for one of them, you'd better have something ready for the other as well, or else... hee hee. I kept it super simple, since he's only 4 *wink* I think he'll be pretty happy that he can read the card for himself. He'll either guess that it says "you're a star" or "you're a winner" - I'm giving him points either way. 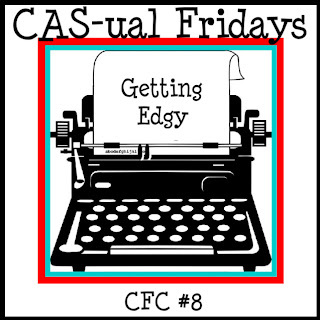 CAS-ual Fridays... better late than never!